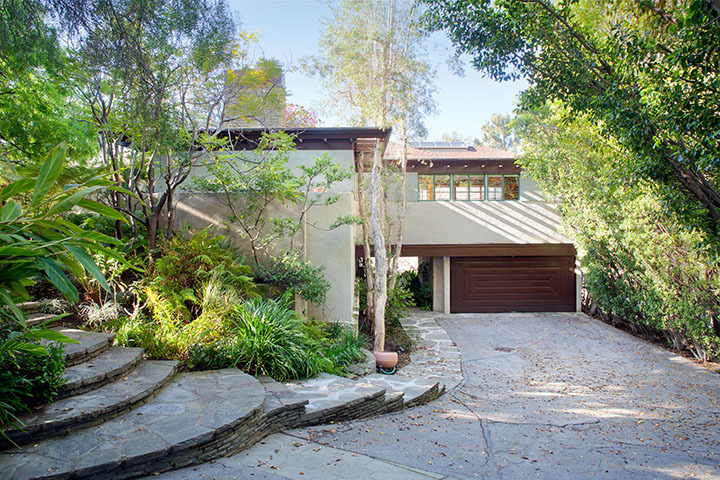 Lloyd Wright, son of famed architect Frank Lloyd Wright and a modern master himself, designed the 3,100-square-foot, four-bedroom Brentwood, California, home in 1936. It's currently on the market for $4.395 million. Like many of Wright's Los Angeles designs, the property prioritizes indoor/outdoor connection and rich materials including cypress paneling and Brazilian walnut tile flooring. The elevated dining area room looks out onto the half-acre site. In recent years, the house has been restored. The yard is paved with Texas limestone and bluestone and features a Mayan-inspired koi pond. The house was originally built for Charles Warwick Evans, cofounder of the London String Quartet. Many details throughout are custom. The fireplace is copper. The architect's thoughtful use of natural materials is a technique passed down from his father, Frank Lloyd Wright. The kitchen is one area of the house that's been updated. The floors are ipe, and the appliances are by Wolf and Sub-Zero. The house wraps around the patio and koi pond.